So I got a little more work done on the Halo 4 undersuit. Not a ton as my EVA foam came in so I started playing with the outter armor, but still worked on it a bit. Mainly I worked on drafting the underarmor’s elbow protection. I threw in some basic measurements in case anyone wants to try to duplicate what I did. Of course, this is sized to me so people will have to size up/down as needed. But this extends from the upper forearm to the lower tricep and wraps around the arm only slightly. I also got in my fabric swatches. I think I’ve chosen my final stretchy fabric choices but still deciding on the mesh. The mesh sample I got from SpandexWorld is great in that it stretches but the whole are super tiny. I was hoping for something a little larger to imitate the honeycomb pattern on the Spartan-IV suits. Not sure if I’ll find a stretchy mesh with larger openings, but we’ll see. This is amazing work by James_005 over at the 405th. 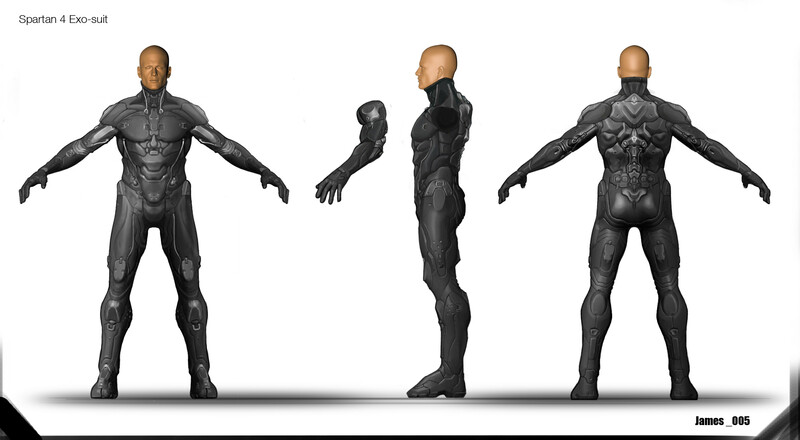 A great front, back and side view of the Spartan-IV (Halo 4) undersuit. Beautifully done. Probably not going to find a better look at the suit than this. It hits all the details from top to bottom. Click here for the full-size/HD version. Last few days I’ve been working on the Halo 4 underarmor suit pants, since I’m still waiting for foam and fabric swatches to come in. I haven’t made many pants in the past and the ones I have had been for my historical fencing so they were baggy breaches and not form-fitting pants. So this was a little bit of an adventure and experiment but I think it turned out well. Now that I had my pictures at hand, I could start drafting a pattern & mock up. Grabbed a couple more screencaps of Master Chief’s Halo 4 undersuit from one of 343’s making of videos. It’s a bit on the darker side and not sure it sheds any new light on what the suit looks like, but here ya go nonetheless. I’m waiting for most of the supplies to ship in so I can start the actual armor building, but the wait means I have plenty of time to work on the Halo 4 Undersuit. I know a lot of people freak out when they think about possibly creating their own undersuit from scratch since sewing isn’t a skill most people learn growing up (not for anyone I really knew), but it’s really not that bad. My girlfriend taught me and if I could learn anyone can. Like the outer armor, it just takes time and dedication to learn the basics. I’m hoping this can help people get on the right track. Note: The rest of this post takes place over the course of several days, so don’t freak out if you try this yourself and don’t get it done in a day. If you do, you’re a sewing monster. First off I wanted to get some good reference shots of what the new undersuit looks like… or, in this case, any reference shots. There’s not much out there since the game isn’t even a month old yet and it’s usually covered by the outer armor anyways, but luckily we have Spartan Ops to help out. I snagged a few screen caps of the what the undersuit looks like in the mini films before Episode 1. Thanks for stumbling across this blog. I’m embarking on an attempt to build Halo 4 armor out of EVA foam and an undersuit to go along with it. I’m on the 405th Forums as theTavernKnight. I give quick updates on how everything is going on there, but here I’ll get into more detail for people that want to really follow along and see how things are going. To the left is roughly what I’m aiming at, though the shins and forearms might get tweaked depending on my mood. I’d love to do the Halo 4 recon helmet and torso. Currently, there’s no Pepakura files for those so I’ll wait to do those pieces last. If there’s no files made by the time I get that far I’ll have to try to do it from scratch which is a bit daunting, but not impossible. I’m also working on an undersuit to go with this. Luckily, I have plenty of sewing experience so the undersuit won’t be too much of a problem except for the neck which I’m sure will be very much a trial & error deal so it’ll sit correctly and not slip down, yet is comfortable to wear. The undersuit will be made out of a mix of tool mesh, stretchy fabric and leather. More on this in a later post. Also looking to create some foam weapons while I”m at it. On the roster is the Magnum, DMR and BR — my favorite loadouts. Maybe I’ll work on creating a glowing sticky while I’m at it for fun. The fabric swatches have been ordered to finalize color/shade and material. A bunch of EVA foam sheets also ordered so I can start working on the armor once it comes in. And I’m off the the craft store to pick up some craft foam and other supplies. That’s it for now. I’ve started drafting the undersuit pattern and worked on the torso mock up. I’ll do a post on that shortly.